Day 3 of the ASH meeting starts off with talks about antibodies and targeted therapies. We begin with additional data on isatuximab—the monoclonal antibody that targets the same myeloma cell surface protein as Darzalex, CD38. Today, European investigators led by Dr. Enrique Ocio of Spain report on the use of isatuximab as part of a 4-drug combination regimen with Velcade + Revlimid + dexamethasone (IsaVRD) in newly diagnosed patients who are ineligible for a stem cell transplant (ABSTRACT 595 https://ash.confex.com/ash/2018/webprogram/Paper111244.html). Twenty-seven patients were enrolled on the study and received induction (initial) treatment with IsaVRD and 100% of patients treated achieve a response—with 92% achieving a very good partial response or better. About 44% achieved minimal residual disease negativity (ie, no myeloma cells detected in the bone marrow). The most common severe side effect was low blood counts. As noted previously, isatuximab is a drug to watch as it may be one of the next treatments to receive FDA approval to treat myeloma. 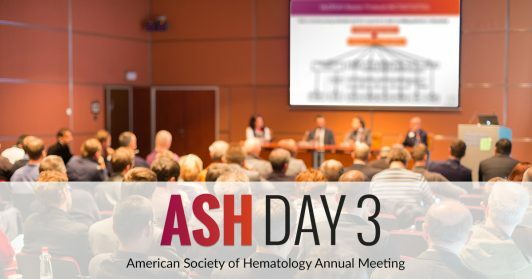 Investigators from the Netherlands studied the use of Ninlaro + Darzalex + dexamethasone (IDD) in patients with newly diagnosed, transplant-ineligible patients—those who are older, unfit or frail—a patient group that requires treatment that can be tolerated (ABSTRACT 596 https://ash.confex.com/ash/2018/webprogram/Paper114668.html). As noted from a different abstract presented on Sunday (ABSTRACT 305 https://ash.confex.com/ash/2018/webprogram/Paper111796.html) fitness refers to a frailty score that combines age, functional status, and comorbidities—factors that contribute to older patients’ outcomes to treatment. Dr. Sonja Zweegman reported on 20 patients treated (10 unfit and 10 frail) with IRD and she found that 100% of unfit patients responded and 80% of frail patients achieved a partial response or better. She concluded that the IDD combination is feasible in unfit and frail patients and associated with a 6.7% mortality rate. The results showed that the combinations were well tolerated and no new side effects identified than would be expected from the drugs and deep and durable responses occurred. The last 3 talks from this session discussed two potential new therapies: selinexor and melflufen. Selinexor is a new class of drug called the selective inhibitor of nuclear export (SINE) and works by blocking the export of proteins from the nucleus of the myeloma cell. Proteins then build up in the myeloma cell nucleus and thereby kill the cell. This new class is being studied in patients who have been on all different classes of therapy and have since relapsed: the proteasome inhibitors, the immunomodulatory drugs, and the monoclonal antibodies. Patients who have been on all of these previous therapies and have either relapsed or become resistant represent an unmet need in myeloma. Two presentations addressed the safety and efficacy of this potential new class of drug. The first presentation by Dr. Ajai Chari of Mount Sinai School of Medicine, administered selinexor + dexamethasone to 122 patients who were refractory to five previous treatments (called penta-refractory patients)—even patients who had prior CAR T-cell therapy (ABSTRACT 598 https://ash.confex.com/ash/2018/webprogram/Paper116663.html). Approximately 26% of patients achieved a partial response or better with treatment. The second presentation by Dr. Cristina Gasparetto combined selinexor + Darzalex + dexamethasone in 25 relapsed patients who had previously received proteasome inhibitors (like Velcade or Kyprolis) and immunomodulatory drugs (like Revlimid and Pomalyst) (ABSTRACT 599 https://ash.confex.com/ash/2018/webprogram/Paper117201.html). In patients that had not received any Darzalex as their previous treatments, 79% achieved a partial response or better. Selinexor represents a potential new agent for myeloma patients who have exhausted many of the approved therapies, and the MMRF is proud to have partnered with Karyopharm to support the the early and late-stage clinical trials for the drug. Another new agent called melflufen is in a class call the peptidase enhanced compounds. Melflufen can selectively target and kill myeloma cells through a unique mechanism of action. Dr. Paul Richardson from the Dana-Farber Cancer Institute reported on the use of melflufen + dexamethasone in 83 patients with relapsed myeloma (ABSTRACT 600 https://ash.confex.com/ash/2018/webprogram/Paper113095.html). Thirty-three percent of patients achieved a response to therapy. Low blood counts was the most common side effect. Early results are promising and we look forward to seeing additional data. At Tuesday’s late-breaking abstract session, Dr. Thierry Facon of Hopital Claude Huriez in France presented the data from the Ph 3 MAIA study, which compares outcomes for 737 transplant ineligible newly diagnosed myeloma patients treated with Dara-Revlimid-dex vs Revlimid-dex. Patients who were treated with Dara-Rd saw a 44% decrease in risk of progression or death compared to those treated with Rd. In addition, MRD negativity was achieved in 24% Dara-Rd patients vs only 7% of Rd patients. These exciting results suggest that Dara-Rd may become the new standard of care for this patient population.